As all IMEI Checks, Samsung IMEI Check is able to fetch a full report about your device through dedicated and restricted databases. Android devices can also be SIM-Locked, as all Smartphones, so performing a Samsung IMEI Check to a Smartphone before buying it is a smart move. Samsung IMEI Check – What it should include? In general, all Smartphones have the “danger” of being SIM-Locked, Blacklisted, Under Contract, have Unpaid Bills and be locked on Google Accounts (iCloud accounts for iPhones). Check below the description of all the above sub-checks and some sample reports. The Samsung SIM-Lock IMEI Check will inform you if your Samsung is Locked or not, meaning, if your device can use more than one Carrier. 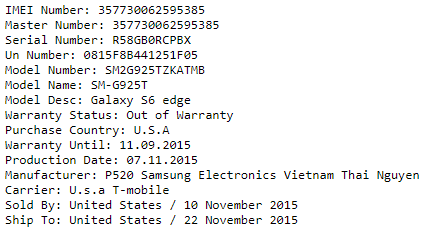 Most of the times, the Samsung SIM-Lock IMEI Check will also include a Network Identification if a device is Locked. The next step is for checking the Blacklist status of a Samsung device, which will inform you if your device is CLEAN or LOST/STOLEN/FRAUD. Always avoid the Blacklisted Samsung devices, since not only you will have restrictions (You will not be able to use it inside the country that it was blacklisted) but you might also have issues with the law! Devices that are in contract, will most likely be locked and have Unpaid Bills with a Mobile Network. The Contract and Financial Samsung IMEI Checks will provide you accurate and up to date information about the Contract and Financial status of a device. The reason that I am mentioning the “order” is because there are not FREE services that can provide SIM-Lock and Network Identification accurate results. The same goes for the Blacklist status of a Samsung device. The FREE services (There are some) have access to private databases which are not accurate and are not up to date. This means that their results will most likely be wrong and they might lead you into buying a LOCKED or BLACKLISTED device. 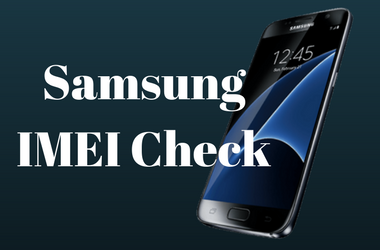 You can find some paid Samsung IMEI Check services to our Review Category and pick the one that best suits you. Leave us a message below, if you have any recommendations of FREE services with accurate information for Samsung IMEI Check reports.